This is the moistest, softest, juiciest cake I’ve ever made. I literally heard the cake squish when I sliced it from the pineapple juice glaze that soaks into every crevice. It’s a fast, easy, one-bowl, no mixer, from-scratch recipe that’s as easy as using a boxed mix which I see often with poke cakes. The cake is just screaming with over-the-top pineapple flavor. 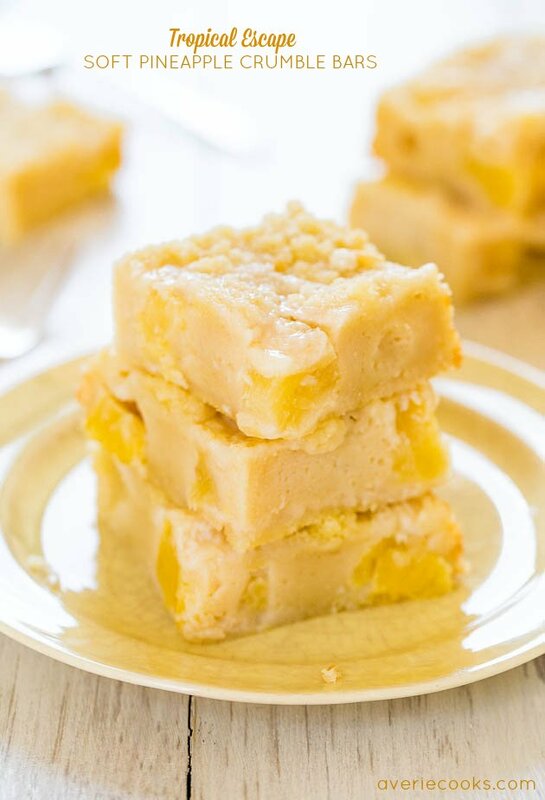 If you’re a pineapple cake or pineapple dessert lover, this is the cake for you. There’s crushed pineapple inside the cake and the glaze is made with pineapple juice. Rather than just pouring the glaze over the top, first take a small paring knife and poke the cake in about 25 spots, lightly twisting the knife with each poke. You don’t need to make craters or get too wild poking because the glaze finds a way to soak in. The longer you can let it soak, the better. I let mine soak overnight and the next morning I was in pineapple heaven. 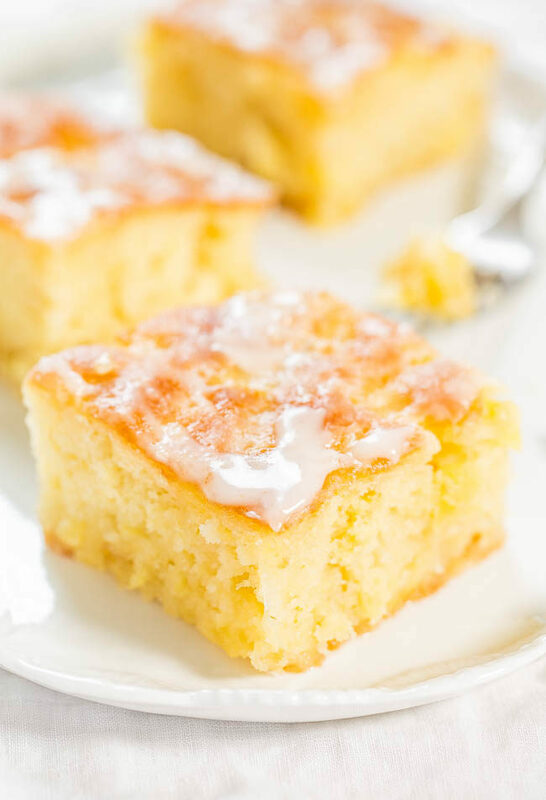 This is one of the best cakes I’ve ever made and definitely very sweet from all the wonderful pineapple. I made this sweet cake full of Southern flair to celebrate Ovation TV’s new show, Southern Uncovered with the Lee Bros. Matt and his brother Ted explore a different city in the South, seeking to expose the unique and unexpected sides of Southern cuisine and culture. This is the moistest, softest, juiciest cake I’ve ever made because of the sweet pineapple juice glaze that soaks in. 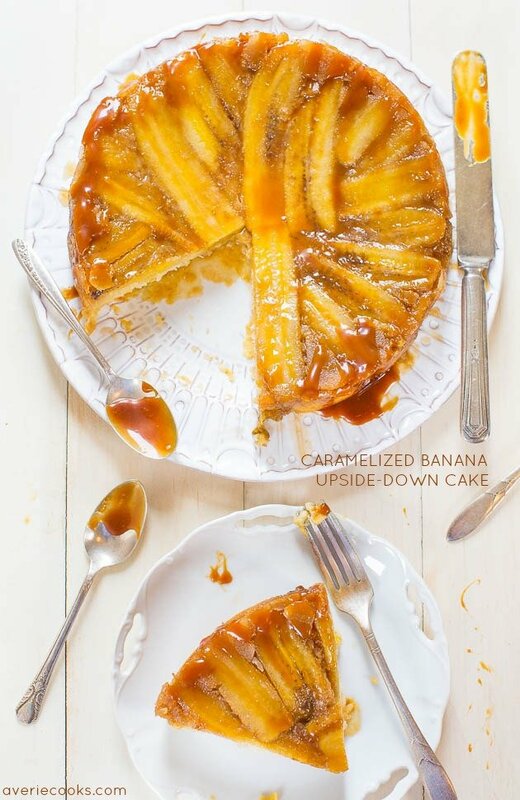 It’s a fast, easy, one-bowl, no mixer, from-scratch recipe and the cake is just screaming with over-the-top pineapple flavor from crushed pineapple inside the cake and the glaze is made with pineapple juice. Rather than just pouring the glaze over the top, first poke the cake in about 25 spots and the longer you can let the glaze soak, the better. 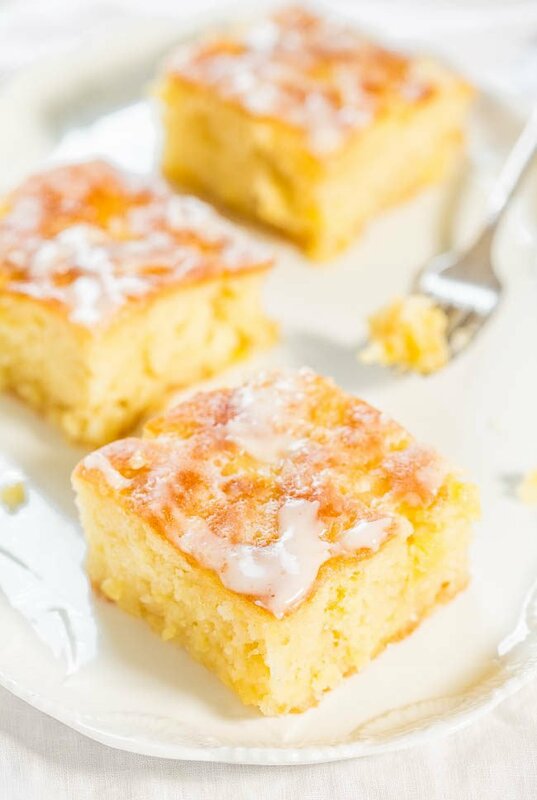 This is one of the best cakes I’ve ever made and definitely very sweet from all the wonderful pineapple. Wait momentarily before adding the eggs so you don’t scramble them. Add the eggs, granulated sugar, vanilla, and whisk until smooth. Add the flour, salt, baking soda, and stir until just combined, don’t overmix. Add the crushed pineapple and stir to combine. Make sure the pineapple has been very well drained because if it’s not the cake will be so moist and wet that it won’t set. Reserve the juice for the glaze. Bake for about 36 to 41 minutes (I baked 39 minutes), or until done. Baking times may range dramatically due to the moisture level in the pineapple (some fruit is much juicer than others), how well it was drained, climate and oven variances, etc. If you feel like cake is browning too quickly on top before it’s setting up in center, tent with a sheet of foil (loosely drape a sheet of foil over the pan) and bake until done. A toothpick inserted in the center should come out clean, or with a few moist crumbs, but no batter. Set cake on a wire rack to cool momentarily while you make the glaze. In a large mixing bowl, add 2 cups confectioners’ sugar, 3 to 4 tablespoons of reserved pineapple juice, and whisk vigorously until smooth and combined. Depending on glaze consistency and preference, you may need to play with the sugar and juice ratios slightly; set glaze aside. Using a small paring knife, poke the cake in about 25 spots, lightly twisting the knife with each poke. You don’t need to make craters or get too wild poking because the glaze finds a way to soak in. Evenly pour glaze over the cake. If glaze is pooling near the sides of pan, use a spatula to push it back up into the center and then use the spatula to ‘squish’ it down into the holes. Even if it looks like there’s too much glaze, it eventually soaks in. The longer you can let it soak (overnight is optimal) before slicing and serving the cake, the better. Cake will keep airtight at room temperature for up to 5 days, or in the freezer for up to 6 months. 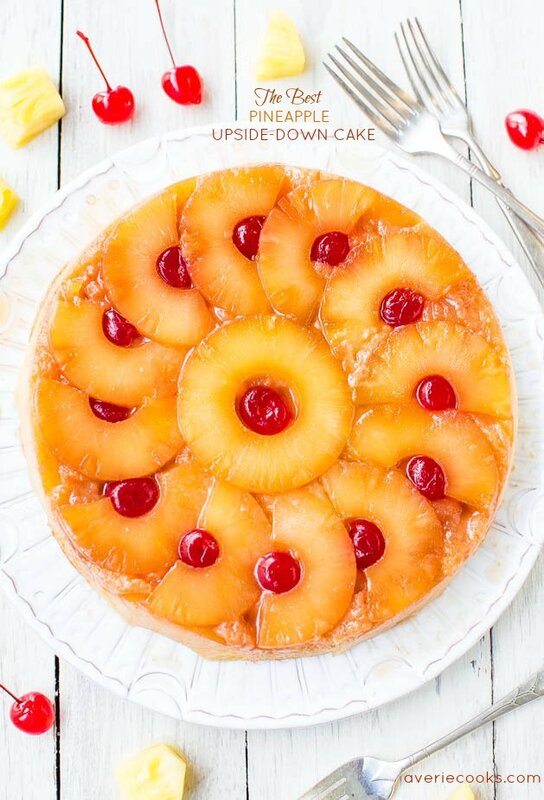 The Best Pineapple Upside-Down Cake – So soft, moist and really is The Best! A cheery, happy cake that’s sure to put a smile on anyone’s face! 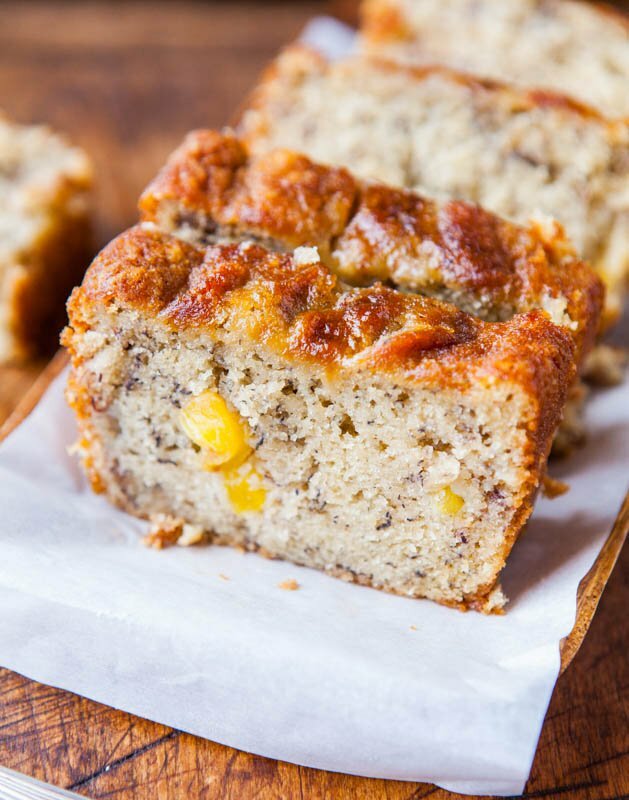 Pineapple Coconut Oil Banana Bread – Soft, moist, fluffy banana bread with pineapple chunks! Tastes like a tropical vacation! 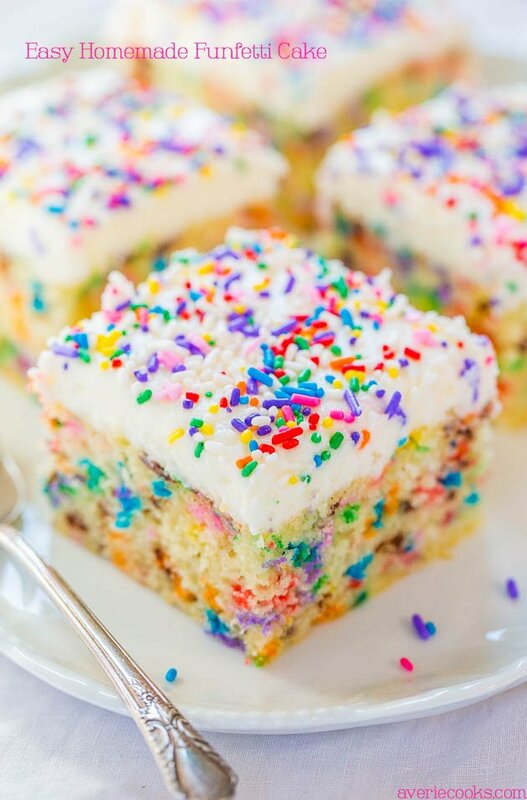 Easy Homemade Funfetti Cake – Move over storebought cake mix!! 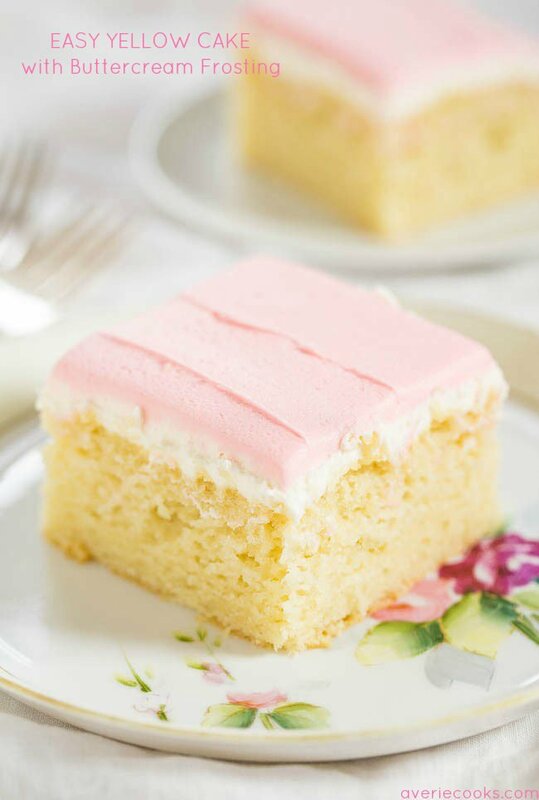 This easy cake only takes minutes to make and tastes wayyyy better!! 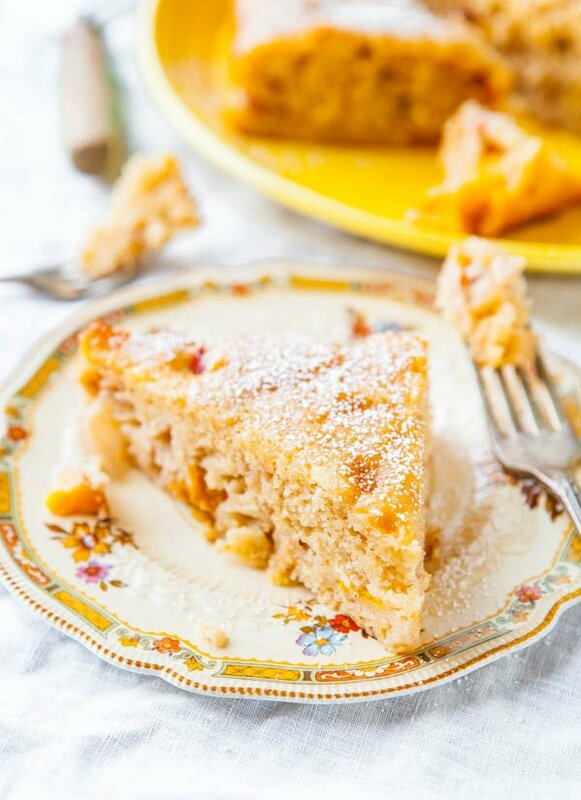 Peaches and Cream Fluffy Muffin Cake – The softest, moistest peach cake you’ll find with a tender, fluffy crumb just like peach muffins! Post is brought to you by Three Degrees and Ovation TV. The recipe, text, images, and opinions expressed are my own. Maybe the #LeeBros will make it to your city! Catch the premiere of Southern Uncovered Sunday, June 14 at 8/7c on @ovationtv! I needed that last comment here with more directions on the glaze. I just pulled my cake out of the oven and usually poke cakes get “poked” right away while still warm, I think. So I am letting this one cool and then poke and glaze. Thanks. PS. I made your Funfetti cake last night and my family went crazy for it. (5 year old wants it for his Birthday cake) I am not a sprinkle girl but I took it easy on them (still looked sprinkley) and it was delicious. I am waiting for some Nielsen Massey Pure Vanilla Bean Paste to come in from Amazon today and gonna try the sprinkle cake again using it instead of the extract and see if there is a huge difference. I just came across the stuff a couple days ago and ordered it up right away to try. Have you ever tried it? Now that I think of it, Maybe I saw it on your website?! Glad the Funfetti cake was a hit! Vanilla bean paste is definitely more intense than regular vanilla. I don’t know if a Funfetti cake with all the sprinkles though would be the best place to use it. I mean you can’t go wrong, but in terms of saving some $ since the stuff is expensive, I’d use it in something with less ‘going on’ like a plainer cake, muffins, etc rather than the Funfetti but that’s just me. 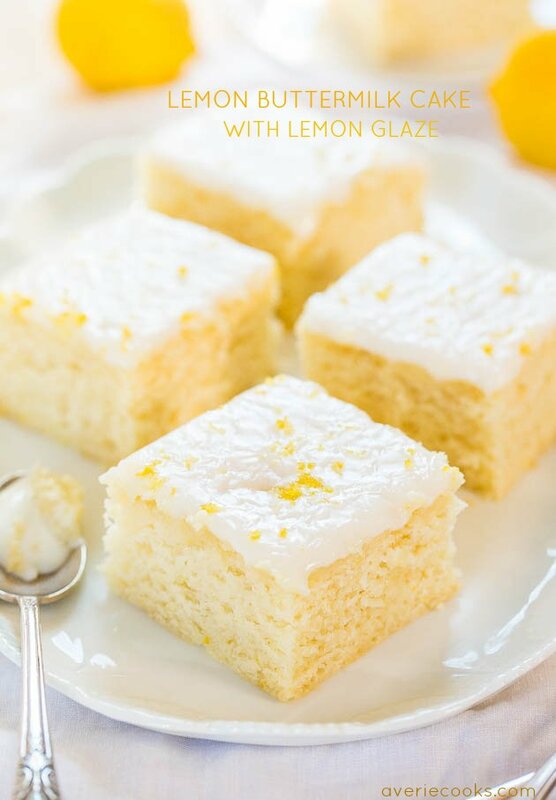 You can put this glaze on when the cake is still warm for the Pineapple Poke Cake. That’s what I did. I mean I waited maybe 5 minutes, it’s not like I was timing myself but I didn’t intentionally wait any longer than it took me to make the glaze, maybe 3-4 minutes. Enjoy! Oh, I guess I didn’t think that sprinkles added much flavor to the cake but in all honesty the cake is perfect (flavor and presentation) as you have written it. I will save the vanilla paste for something else. The Pineapple cake is good but the glaze was way too overwhelmingly sweet for me. 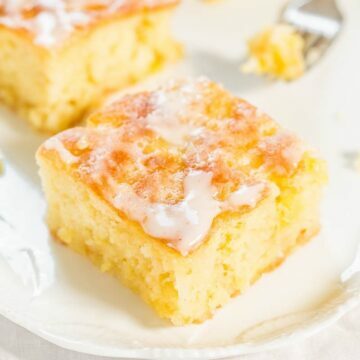 I actually used some of the plain pineapple juice left over after making your glaze and mixed with very little powdered sugar to pour onto the cake and into the cut markes then topped it with about 1/4 cup of your glaze. So I still have the white semi-translucent glaze on top and more of the pineapple flavor in the cake. Now, I did eat about 1/4 of the cake (don’t judge) right away (SO GOOD) and I am afraid the rest will be too “wet” when I go back in tonight. 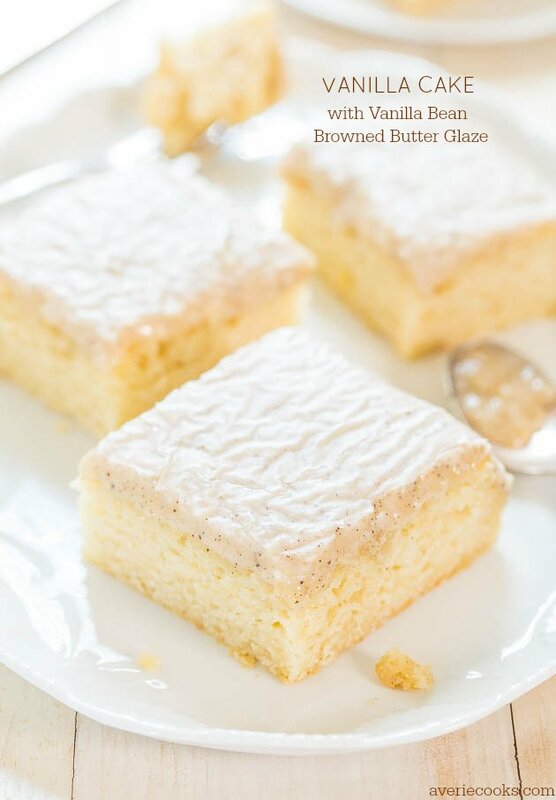 I wonder if the measurements are correct for the glaze: 2 cups of powdered sugar and 3-4 Tbsp. of pineapple juice? It made A LOT of glaze and it was extra super thick after adding 5 Tbsp of juice. Yes the measurements are correct for the glaze, and a I wrote to add additional juice as necessary for consistency. If your glaze was too thick for your liking and/or too sweet, a splash of water will thin it out without adding sweetness. Very easy fix. And no I don’t believe the cake will be ‘too wet’ later…that’s the point of a poke cake; it soaks it up! Thanks so much for your help. The cake was amazing! I’m glad I doubled the recipe so there was plenty to eat and a little left to send home with friends. (We got to keep a little bit too!) I’ll be making this again! Could you do it in a bundt pan? Possibly. I haven’t tried it that way so can’t say for sure. Thank you for the recipe. I actually made it today in a round pan. It took approximately 25 min. It is totally delicious. I was thinking of making it with toasted coconut sprinkled on the top, after icing the cake. Pineapple and coconut are great together! It’s an easy cake to make, and very moist as you said. I don’t think it would last long in the fridge, nor freezer!! Thank you again! Thanks for trying the recipe and I’m glad it came out great for you and that the round pan worked fine! I used to enjoy Poke Cake with Pineapple Pineapple Glaze. This is a dish that my family and I love. Can you change your measurements to gram? I’m sorry because I live in asia and I’m not used to with your measurements. Can I used fresh pinnapple instead of the can one? I don’t use grams so cannot give measurements. However, there are online calculators that can do these conversions for you. I haven’t tried with fresh pineapple because you need the juice, too, and that’s why it’s easier and more cost effective for me to use canned. just made this today and it was so easy and delicious!! really unique and super moist! the tang of the pineapples is balanced really nicely with all of the glaze. i would definitely make this again! I only tried the recipe the way I wrote it so can’t speak for sure about substitutions. I’m sure fresh pineapple will work but I can’t give any specifics on it since I haven’t tried it, how you will need to adjust baking time, etc. I tried your recipe with fresh pineapple and it turn so awesome, good moist. I cooked the pineapple for 20 minutes and I drain it very well. The juice is soo nice that make my glace taste better. Oh I add a lemon rind to the cake. If my laws love it I will make it again. Thanks so much for sharing. Thanks for trying the recipe and I’m glad it came out great for you! And great that you were able to incorporate fresh pineapple – glad you’ll make it again! Happy Mother’s Day! This cake is amazing !! I didn’t change a thing and my family wiped it out within 15 minutes. I will definitley be making this again. Thanks for trying the recipe and I’m glad you’ll definitely make it again! Love that it was wiped out in 15 minutes! Looks wondeful. Def will make this. Some of my fave kiddie food memories involved ‘Nilla Wafer Banana Pudding Bowls (always my BDay request ‘cake’) & Pineapple Upside Down Cake i the cast iron skillet. I have a pretty elaborate recipe bookmark system & placing several of your pineapple recipes w/haste. :) Love that it is quick, one bowl & no larger than it is. Do not think I will have a problem eating all of this, as I would if it were a 13X 9. I am also bookmarking your site, which I rarely do. Thanks! Thanks for bookmarking and enjoy the cake! I musta did something wrong cuz my cake is pretty flat ? This isn’t a ‘tall’ cake. There’s only 1/4 tsp baking soda in it so it doesn’t rise tons but possibly if it’s dense and flat that could be expired baking soda? or maybe you just had really juicy pineapple that weighed the cake down a bit. This is the first recipe tat I have made from your website, and it is a really good cake! A little too sweet for my liking, but my family went crazy over it..Considering the fact that they react like this only for chocolate cakes, this was a revelation. Thank you Averie, for the lipsmacking recipe! ? I made this for a luau party, and it was a huge hit. The cake disappeared with in minutes of putting it out, and I was asked for the recipe more than once. I doubled the recipe, but only had 2 14oz cans of pineapple. I was a bit worried, as that is a big difference, but it turned out perfectly. To be honest, I wouldn’t have wanted any more pineapple in the cake. I only made 1.5 times the glaze, and did not use all of it. This cake is amazingly delicious, and uber sweet. Thanks for trying the recipe and I’m glad it came out great for you! Glad it was a huge party success! Thanks for trying the recipe and it’s one of those things that it’s hard to describe in general how much to drain, exactly, the pineapple. Sorry that you took it to the extreme! Just made this tonight and it’s delicious!! So easy! Only took about 20 minutes in the oven for me and did half the glaze and it was plenty. Your recipes are winners every single time! I also made your strawberry banana cake again yesterday and it was a hit. Thank you!! I always say I’m gonna comment on recipes but never get around to it lol. 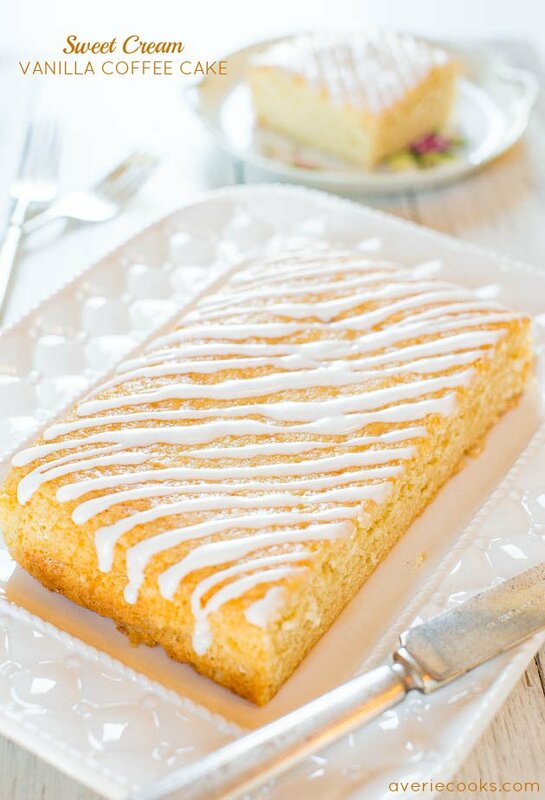 This cake was SO good & so easy, I had to make it again the very next day! Absolutely perfect the way it is, just adjust the glaze to your individual tastes & voilà! Thank you for posting this!! Thanks for the 5 star review and for taking the time to comment! Glad you loved the cake!